I had a request for a quinoa recipe the other day… so I found some salmon on sale at the store, some quinoa in my cupboard, and some pots and pans on the stove! Quinoa is a great grain, boasting high fiber and protein… 6 grams of protein and 3 grams of fiber in a quarter cup dry serving. It’s a great gluten free alternative… especially when rice is getting boring. While the quinoa is cooking, saute the mushrooms and asparagus in the olive oil and salt and pepper. Saute them on medium heat until tender. Add one quarter cup water if needed. While the veggies and quinoa are cooking, saute the salmon. Put the butter in a saute pan, and melt over medium heat. Place the salmon steaks skin side up. Add the dill and lemon juice. 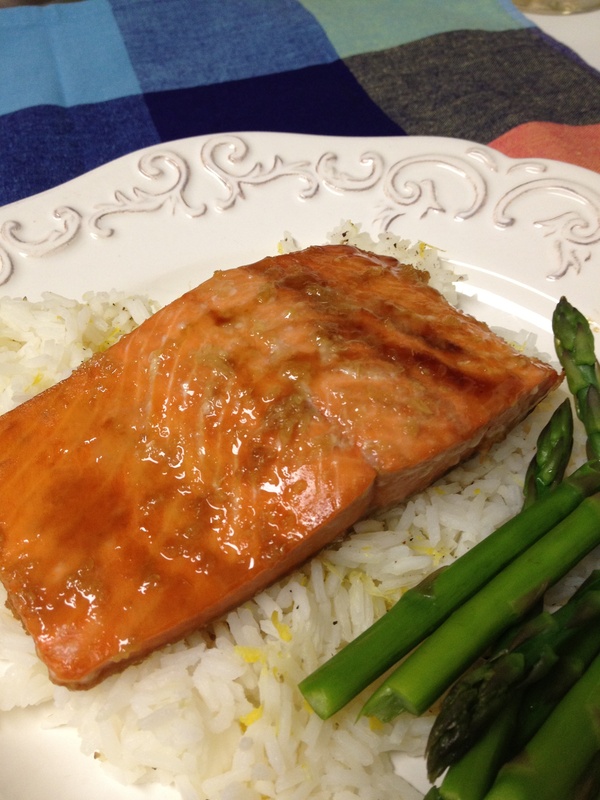 Let the salmon cook about 5-7 minutes. Add one quarter cup water if the pan gets dry. Heat until cooked through. Add the lemon zest and a dash of salt and pepper to the quinoa. Fluff with a fork. 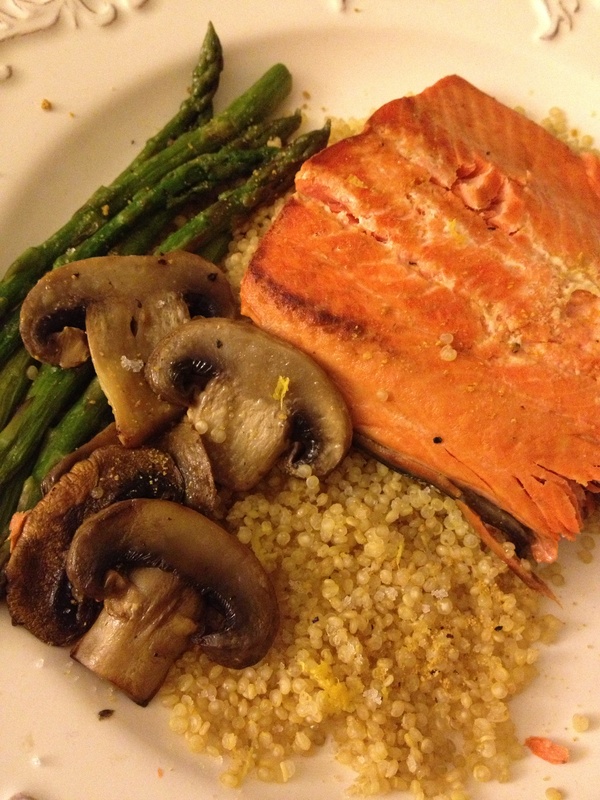 Serve the quinoa on a plate, topping with the asparagus, mushrooms, and salmon on top. I just got home from a great visit with my parents in North Carolina. I love visiting my family, but especially since my mom is such a great cook. She always find the most interesting flavors and dishes! This next one is one that she found through her local fish market and is from Bon Appetit. I don’t usually make fish myself purely because I prefer chicken and beef, but this salmon recipe is definitely a keeper. It was so quick and easy, but certainly tasted fancy and rich! Position rack in center of oven and preheat to 450°F. Line large rimmed baking sheet with parchment paper. Mix first 7 ingredients in medium bowl. Season mustard sauce lightly with salt and generously with pepper. Place salmon, skin side down, on diagonal on prepared sheet. 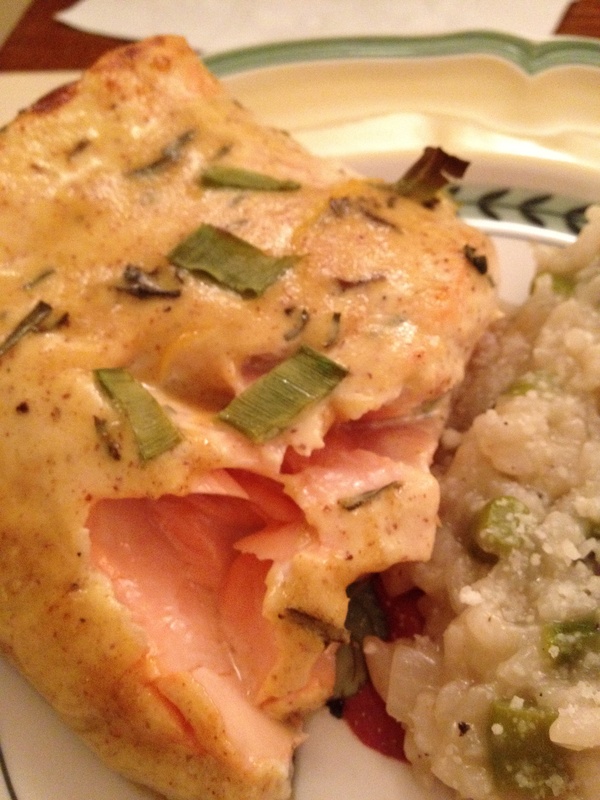 Spoon 1/2 cup mustard sauce atop salmon, then spread over, covering completely. Sprinkle salmon generously with salt and pepper. Roast just until salmon is opaque in center, about 15 minutes. Using parchment as aid, transfer salmon to platter. Cut crosswise into pieces and serve with remaining mustard sauce.